Ed is one of my gardening friends. Every time someone in the community garden mentions a new or interesting plant to grow, Ed's first response is, "Can you eat it?" My father has been growing canna "lilies" (which are not lilies) for years. We never knew much about them except that they were very prolific. He got a few rhizomes from a friend several years ago and they multiply so much that he can't find enough people to give them away to and he ends up throwing away buckets full after he lifts them each fall. He passed some along to me when I finally got my own bit of earth and they made quite a lovely show this past summer in one of my heavily composted raised beds, growing to a height of over seven feet and feeding hoards of hummingbirds with their gaudy red blooms. While everyone else "oooohed and ahhhed" and wanted to know what these beauties were, Ed remained unimpressed. "Can you eat it?" As far as I knew, because of their attraction to the ruby-throated hummingbirds, my cannas exemplified only one of my current garden obsessions - being helpful to pollinators. So when Ed asked, "Can you eat it?" I told him that, unfortunately, I didn't think so. But of course I started doing research and discovered that the large, banana-like leaves are often used as a wrap for cooking fish and other things. Ed and Steve are friends and Steve is growing cannas also. Steve and I were loving the mystery if it all...his Chinese mom brought their cannas from California and they were both surprised that my variety appears to be exactly the same. Both our cannas look like photos of the original "wild" canna that comes from South America. I've also read that Native Americans in the Northwest used them as an important food source (citation needed.) If THAT is true, then another of my gardening obsessions is fulfilled - NATIVE PLANT, folks! And then came the kicker. Steve told me that his mom told him about cooking and eating the roots as a cure for arthritis. Really? This rocked my world. I'm very excited at the prospect of cooking and eating some of my canna rhizomes. I was growing them for the WOW! factor of their height and beauty, plus their value to the hummers and then I found out that they might be native plants and THEN I found out-quite by accident-that they are truly edible. Quadrupal whammy! 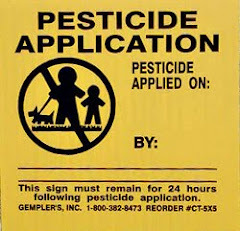 It all started in spring 2009 when I noticed that almost every residence in my suburban town had one of those scary "Pesticide Application" signs on the front lawn. And then my father, a lifelong gardener from a family of gardeners, mentioned to me that he now has to pollinate all of his vegetable plants by poking his fingers into the flowers because he has so few bees in his garden... I've seen more of these signs lately than I care to count. I'm exhausted.